"the car keys conversation" with mom or dad. (FATHER'S DAY, SUNDAY JUNE 15th) - It’s the great debate – who’s the better driver? Mom or Dad? This Father’s Day, dads will love to hear in a recent national survey 63% of adult children say Dad’s a better driver than Mom. However, if adult children had to take away Dad’s car keys because he’s unsafe to drive, many fear Dad would get so angry he’d cut them out of the will. The new national poll reveals more than 3 out of 4 (79%) adult children say telling their parents they’re taking away their car keys because they’re no longer fit to drive is THE MOST uncomfortable conversation they could have with them. 66% of adult children say it will be MORE DIFFICULT to have the car keys conversation with Dad than with Mom. And, 3 out of 4 adult children believe Dad will be MORE UPSET than Mom if he can’t drive anymore. WHO SHOULD TALK WITH DAD? The survey reveals more than half (55%) of adult children would prefer their sibling/s have the car keys conversation with their parents. 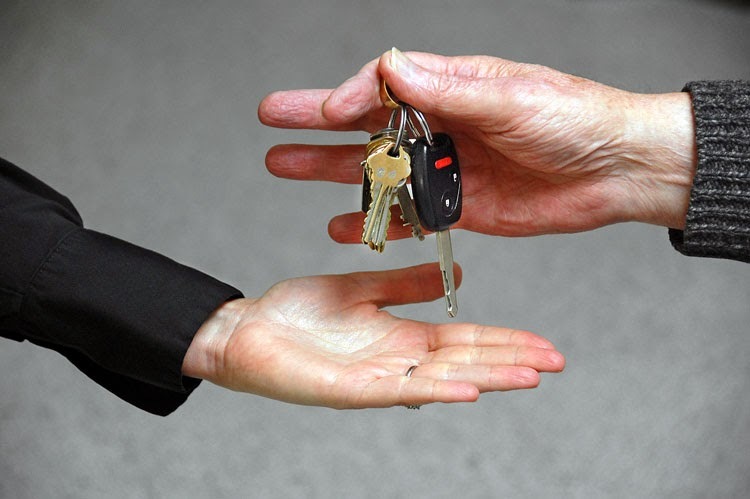 58-year-old Jeff Cooper, of Phoenix, was nominated by his two sisters to have the dreaded car keys conversation with his 85-year-old dad. Jeff talked to his dad four or five times – and each time, his dad was convinced he was still a good driver. Jeff eventually had to call law enforcement and his insurance agency to test his dad. His father failed the tests, and his keys were taken away. Jeff’s father was furious, and he says it would have been nice to have a caregiver help facilitate this difficult conversation with his dad. Are an extra set of eyes and ears for families at home – is Dad on medication that makes him drowsy? Is his hearing getting bad? Are there new dents in the car? Drive seniors to the doctor or the grocery store - the top two places respondents worry their parents can’t visit if they can’t drive (the Visiting Angels survey also reveals 56% of adult children don’t know home care agencies offer this transportation service). WHAT’S SO STRESSFUL ABOUT TAKING AWAY PARENTS’ CAR KEYS? Visiting Angels was established in 1991 in Baltimore as an independent agency caring for seniors in their homes. Today, Visiting Angels has more than 450 private duty agencies throughout the United States. Visiting Angels agencies employ only experienced caregivers and conduct the most comprehensive background screenings to ensure that their caregivers meet or exceed the company’s high standards. For companion care, Alzheimer’s care, Dementia care and the country’s best palliative care program, make Visiting Angels your choice in senior homecare. For more information on Visiting Angels or to find a location near you, please visit www.visitingangels.com.